Please explore our site to learn more about our congregation, worship life, youth programs, upcoming events, Christian education, and all the other ways in which Christ is serving this needy world through the forgiven sinners gathered in His Name. On behalf of our Lord, welcome to our home. Because we, St. Peter’s Evangelical Lutheran Church, are called by God, saved by Christ, and empowered by the Holy Spirit, we proclaim God’s message to all people through worship, teaching, serving, and sharing ourselves, our time, and our possessions. 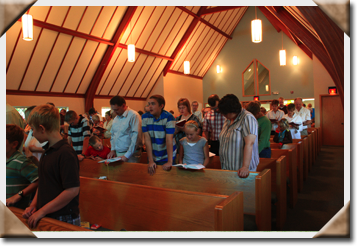 We gather for worship at 9:00 on Sunday mornings. St. Peter’s regularly celebrates the Sacrament of Holy Communion. All who are baptized and believe that Christ is truly present are welcome to share in the Lord’s Supper. Coffee, refreshments and fellowship follow each service. The presence of guests, visitors, friends and family honors us, and we shall do our best to extend true biblical hospitality! Services are also held at the Elders’ Home on the last Sunday and following Wednesday of each month. Sunday School classes meet weekly at 10:00 a.m.
Pub Theology gathers at Mills Liquors at 6:30 p.m. on the third Thursday of each month. Vespers services are held Wednesday evenings throughout Advent and Lent, and we celebrate additional services to mark the feasts and festivals throughout the Church year. Our Office Administrator is available from 8:00 a.m. to 1:00 p.m., Monday through Thursday. As a Lutheran congregation within the greater Christian Church, we believe that Baptism is a promise given by God, and that in it Jesus initiates a relationship with us even before we know to ask. Accordingly, we celebrate the Sacrament of Baptism for all ages, from infant through adult. All who wish to be Baptized, or to have their children Baptized, are welcome at the Font. Please contact the office in advance to schedule an appropriate Sunday; St. Peter’s asks that all Baptismal candidates (including, if possible, parents and sponsors) meet with the pastor ahead of time to discuss the gift of Holy Baptism. We strongly encourage that Baptisms be celebrated within the context of a Sunday worship service. We do, however, celebrate private Baptisms should the need arise. We welcome any couple wishing to be wed at St. Peter’s! The congregation asks that the pastor be notified at least two months in advance of the possible marriage and that the couple meet with the pastor to discuss our wedding policies and premarital counseling sessions. Acolytes — The office of acolyte has an ancient and honorable history dating back thousands of years to the Old Testament. Acolytes, who are typically students from the sixth through tenth grade, help lead the worship of the community and assist the pastor in Sunday services. Their duties include ringing the call to worship, the lighting of candles, the gathering of our offerings, supporting ministers in the Eucharist, and bearing the Cross of Christ before us as we go out into the world. Altar Guild — Love worship? Enjoy the sublime beauty of the liturgy? Want to learn the rich artistic traditions of the Christian Church? Then Altar Guild is the ministry for you! Our dedicated guild prepares, guides, and tidies up all the wondrous feasts and festivals of the Church year. Choir — It is said that those who sing well pray twice. St. Peter’s is blessed to have so many gifted musicians and vocalists in our congregation, and as the rehearsed voice of the congregation our choir offers the opportunity for us to lift our gifts to God. Our choir rehearses on the first and third Wednesdays of each month. 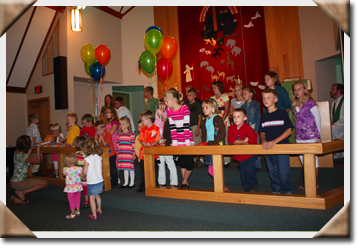 Christian Education Committee — St. Peter’s is blessed to have an excellent and dedicated Education Committee who organize Sunday School, Vacation Bible School, Youth the Younger, St. Peter’s Youth (SPY), and all manner of special events throughout the Church year. Thanks be to God for nurturing us in our faith at every stage of life. Educational Forums — Education is an integral part of Christian life throughout adulthood, and St. Peter’s holds lectures and discussion forums on such topics as world religions, Church history, the Scriptures, &c following worship on the second Sunday of each month. All are welcome! Global Missions — The purpose of the Global Missions Committee is to assist the congregation to be informed of the activities and needs of the Division of Global Missions of the ELCA. Global Missions includes supporting and understanding God’s mission throughout the world, and may include supporting missionaries, the World Hunger Program, disaster relief, and educating the congregation of current programming. Men of St. Peter’s — The men of St. Peter’s serve by helping out with the various needs of our parish, congregation, and members. From grilling and fundraising to heavy lifting and special celebrations, the Men’s Group offers service, fellowship, and charity. Mutual Ministry and Outreach — Mutual Ministry supports and aids St. Peter's pastor in various endeavors, offering insight, suggestions, and constructive criticism. Combined with the Outreach Committee, Mutual Ministry helps to plan New Member Sundays, calls inactive or concerned members, organizes Servant Groups, and is deeply involved in the fellowship of our congregation. Parish Library — For thousands of years, Church congregations have been centers of learning. Accordingly, our Parish Library is constantly being reorganized and expanded, that all may deepen their religious faith through mind, heart, and soul. 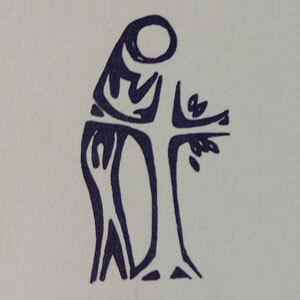 Piecemakers — Our Piecemakers are one of St. Peter’s most beloved ministries. Their handmade quilts, gifted to the needy, auctioned for special causes, and, of course, specially made for the newly baptized, serve to encircle, warm, and protect us just as do the Baptismal promises of Christ, to Whom this ministry ever points. Prayer Chain — The Prayer Chain is the spiritual system that communicates and takes prayerful action on the needs of the congregation, community, and world. The importance of the Prayer Chain is that it faithfully intercedes on behalf of others in need by lifting up specific requests, concerns and emergency situations. Property Committee — This ministry helps us build, repair, and maintain the property which St. Peter’s shares in common. God works through our hands, and thus provides a safe and healthy sanctuary for all to worship the Lord and serve our neighbors! Pub Theology — In the tradition of the Rev. Dr. Martin Luther, we gather at the local bar on the third Thursday of each month for beer, discussion, and outreach. While we offer a starting topic for each outing, the conversation tends to wind wheresoever the Spirit leads us. Social Ministry Committee — The purpose of the Social Ministry Committee is to extend Christian compassion and helpfulness to the ill, the aged, the orphaned, the underprivileged, the imprisoned and, in general, to persons of all ages in need of aid for body or soul. Outreach ministries, the local Food Shelf, our annual CROP Walk, and caring for our community’s seniors are all embraced by our Social Ministry Committee. Stewardship Committee — God gives us all good things as great and abundant gift that we might use our gifts for neighbor and for community. This committee guides us to be wise stewards in every aspect of our life together, whether dealing with stewardship of our time, our talents, or our treasures. Sunday Servant Groups — There are 10 servant groups, each of which takes turns providing hospitality, food (and coffee! ), fellowship, and service for our community’s Sunday morning worship. Here we feed and love our neighbor in a very immediate and wonderful way. Women On a Mission — The Women of St. Peter’s serve by helping out with the many needs of our Church and community. 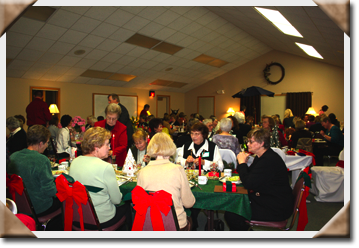 Meals, honor banquets, new construction, special offerings, gift baskets, and fundraising auctions are just a few of the popular and successful ministries spearheaded by our Women’s Group. Worship and Music Committee — These ministers are responsible for hymn selection, scheduling accompanists and special music for worship, seeking guest preachers when necessary, and helping to plan worship services. Sunday School	meets at 10:00 a.m. after worship and follows the Spark curriculum, beginning with our Rally Sunday celebrations at Holyrood each September. Youth the Younger	is for grades three through six (3-6), and they meet once a month after school to do activities together. St. Peter's Youth	is for grades seven through twelve (7-12) and meets once a month also, as well as on some Sundays. Activities, outings, and service projects abound. Confirmation	for seventh through tenth graders meets after worship on the first and third Sundays of each month and follows a three-year curriculum covering the Old Testament, New Testament, and Luther’s Small Catechism. Vacation Bible School	meets for one week every summer, and is available for all children from preschoolers through sixth grade. It starts with a supper for the entire family and is followed by music, crafts, science, games, classroom time and loads of fun for everyone. 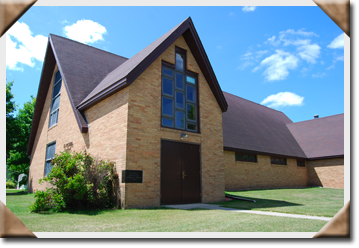 Founded in 1896, St. Peter’s Evangelical Lutheran Church in New York Mills, MN is a congregation in the Northwestern Minnesota Synod of the Evangelical Lutheran Church in America. 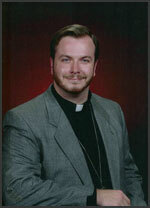 Our current pastor is the Rev. Ryan D.G. Stout. 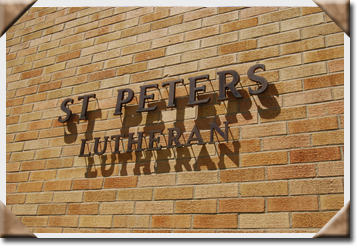 St. Peter’s is a congregation growing in both membership and depth, with a strong tradition of lay leadership, volunteerism, education, and a particular emphasis on our youth. We are Christians of various ethnic and denominational backgrounds, from the very young to the old and wise. Like you, we are sinners loved by God, and brought into the Body of Christ by the Holy Spirit. And all are welcome here. Office hours are Monday through Thursday, 8:00 a.m. to 1:00 p.m. In the event of an emergency, call the parish office to get the current emergency coverage phone number. From east or westbound Highway 10, take the New York Mills exit ramp. Take your second right to go West on Gilman St.
Continue West on Gilman for three blocks and St. Peter's Lutheran Church will be on your left.